Arts Roar featured approximately 1,200 student works that stretched through the high school and middle school hallways. There was a large turnout of students, families and educators. 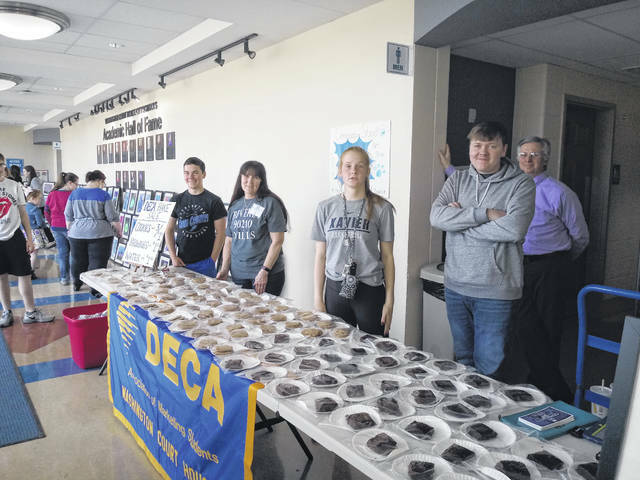 DECA was selling cookies, brownies and water at the event in attempt to raise funds that will go toward their competition jackets this year. Pictured (L-R) are: Connor Lane, Debra Grover, Tabby Woods, Dylan Koutz and David Penwell. Washington Court House City Schools had their second-annual Arts Roar on Wednesday. 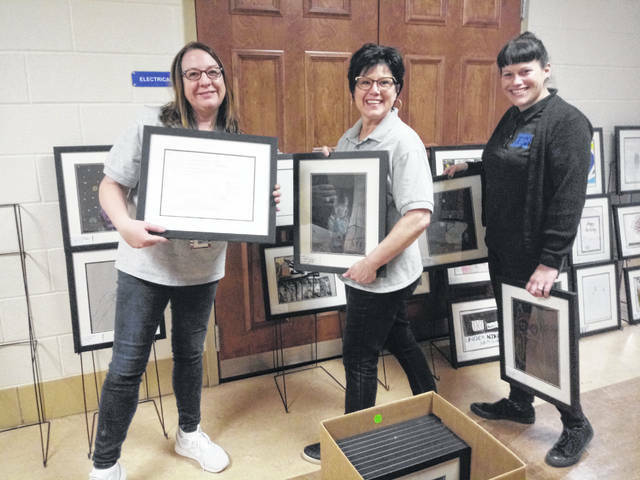 Pictured (L-R) are Tami Rose (Washington Middle School art teacher), Dana Byrne (Washington High School art teacher) and Kelly Howley (Washington High School art teacher). They are setting up framed student work for the art show. 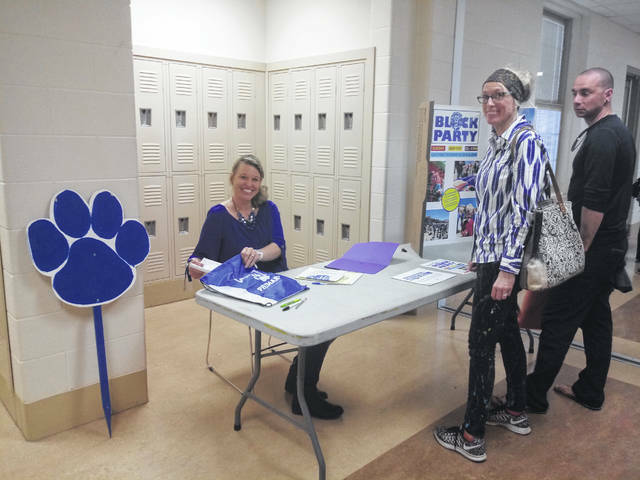 Cherry Hill Primary Assistant Principal Maggie Lyons was selling blue paw-print signs to raise funds for this years block party. Those who bought them could choose to have a name placed on the sign along with a graduation year. Mrs. Lyons is sitting at the table while her sister, Lyndsey Mincey, is in the process of buying one of the signs. The concert that took place during the art show involved the Washington High School Pep Band, Cherry Hill second grade classes, Belle Aire choir, Washington Middle School eighth grade choir, Washington Middle School seventh and eighth grade concert bands and the Washington High School symphonic choir. The gymnasium was packed during the performances. As the art show and concert involved grade levels from every Washington Court House City school, the principals of each school were attending Arts Roar. 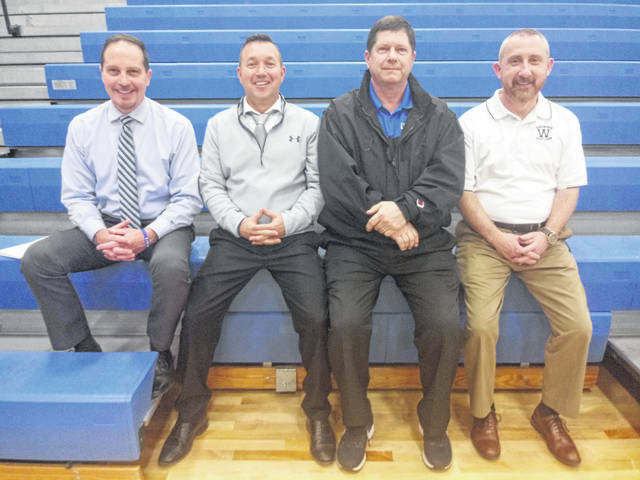 Pictured (L-R) are Middle School Principal Eric Wayne, High School Principal Tracy Rose, Belle Aire Principal Jeff Conroy and Cherry Hill Primary Principal Craig Maddux. 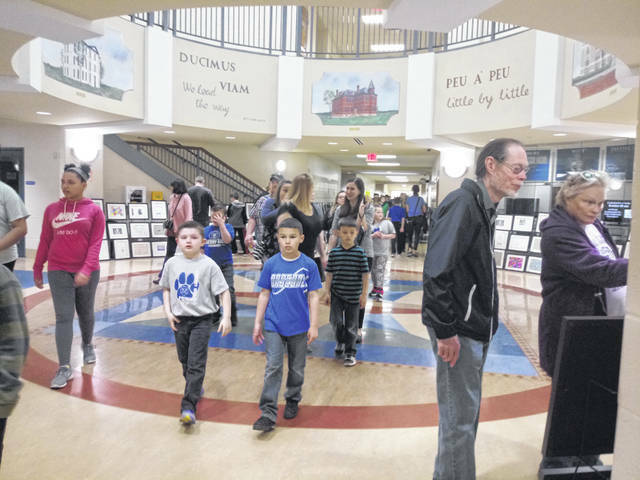 The second-annual Washington Court House City Schools’ (WCHCS) “Arts Roar” brought together many community members on Wednesday. Arts Roar is an opportunity to see WCHCS students’ artwork from second grade through high school. The artwork was sent to Artome, a youth art show provider in Cincinnati, to be framed professionally. The day of the event, Artome set up the artwork for the show with help from school art teachers and volunteers. According to Artome Show Manager Reid Radcliffe, there were approximately 1,200 pieces being shown. During the event, the framed artwork could be bought for $25. Framed work that wasn’t purchased would be sent back to Artome to remove the art from the frames. The unframed artwork would then be sent back to the schools. According to Washington Middle School art teacher Tami Rose, they sold 164 framed artwork pieces during the event. The art department received $6 per frame sold, which would come out to $984 that will go into the art department for WCHCS. The Washington High School was represented by the pep band and symphonic choir. The Washington Middle School was represented by the seventh and eighth grade concert band as well as the eighth grade choir. Belle Aire Intermediate was represented by its choir. Cherry Hill Primary was represented by its second grade classes. Washington High School Band Director Matt Stanley explained the event is a great opportunity to see the fine arts that WCHCS offer. He said the event is a chance for younger students to experience what the older students are capable of. Many of those younger students could potentially enter band in their later school years. The program for the performances was not printed this year but put online. 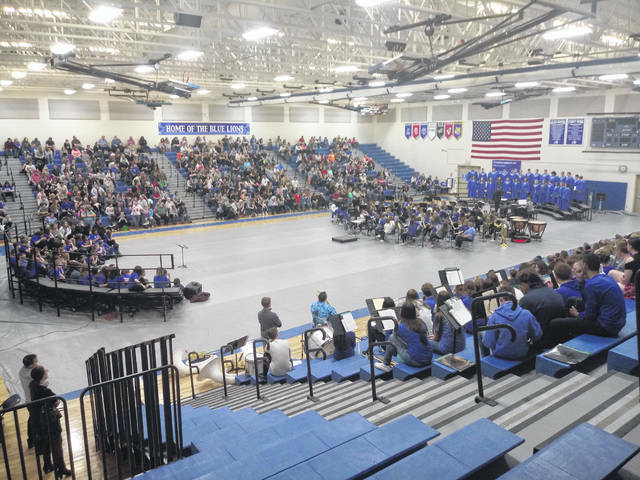 Washington Middle School Band Director Ben Streitenberger said, “We’re going green in a sea of blue.” He asked those attending the performance to pull the program up on their smart phones. Washington High School Principal Tracy Rose expressed a great deal of positive thoughts toward the annual event. Not only do the older students get to see the younger ones, but the younger students get to see the older ones. He directed attention to the younger kids’ faces during the performance warm-ups. When the high-school students began to sing the “Washington Alma Mater,” the younger students’ faces broke into awed expressions: mouths dropped and eyes widened.